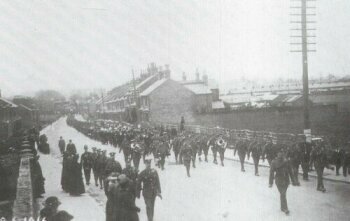 At 14.20 on Sunday, 2 April, 1916, 109 men and boys were killed by an explosion at the Explosives Loading Company factory at Uplees, near Faversham. Fifteen tons of TNT and 150 tons of ammonium nitrate blew up when some empty sacks caught fire. So great was the explosion that windows across the Thames estuary in Southend were shattered and the tremor was felt in Norwich. The crater made by the explosion was 40 yards across and 20 feet deep. The Cotton Powder Company's huge factory, adjacent to the Explosives Loading Company's plant, was also seriously damaged. Most of its site now forms the Oare Marshes Nature Reserve, of international importance for its bird life. This was the worst disaster ever to occur in the history of the UK explosives industry. 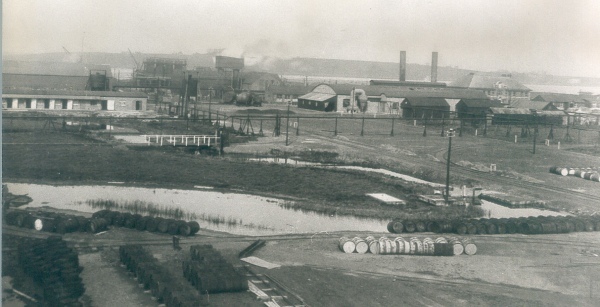 A brave attempt was made to extinguish the fire before it got out of control, but factory manager George Evetts ordered everyone to leave the site when the situation became hopeless. However, the explosion occurred as everyone was leaving the site. Included in the 116 dead, was the whole of the Works Fire Brigade. 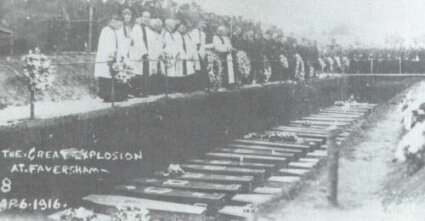 Many firemen died in subsequent smaller explosions on the site. Many bodies were recovered from the surrounding marshes and dykes, but seven were recorded as missing, most probably atomised by the explosion. Many of the dead were buried in a mass grave at Faversham Cemetery on 6 April, 1916.